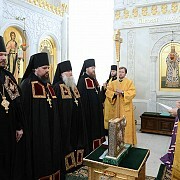 On Wednesday, July 30, His Holiness Kirill, Patriarch of Moscow and all Russia led the Rite of Nomination of Archimandrite John (Roshchin) as Bishop of Naro-Fominsk, Vicar of the Moscow Diocese and Administrator of the Patriarchal Parishes in the USA. 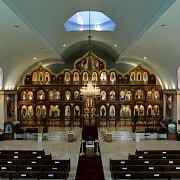 On July 20, the Parish of St. Elias the Prophet in Battle Creek MI, celebrated its Patronal Feastday by celebrating a festal Divine Liturgy served by clergy of the Patriarchal Parishes in the USA. 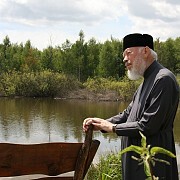 On July 28, His Holiness Patriarch Kirill elevated Hieromonk John (Roshchin) to the rank of Archimandrite. 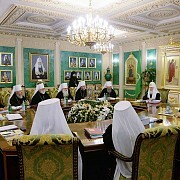 IMPORTANT NEWS: On Friday, July 25, 2014, the Holy Synod of Bishops of the Russian Orthodox Church, under the chairmanship of His Holiness Kirill, Patriarch of Moscow and all Russia concluded in Moscow. 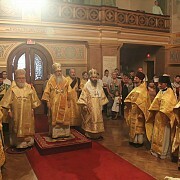 On Sunday, July 20, 2014, the Patriarchal Parishes in the USA prayerfully concluded its celebrations of the 700th Anniversary of St. Sergius of Radonezh at St. Nicholas Cathedral in NYC, presided by the Most Blessed Tikhon, Metropolitan of All America and Canada. On Saturday July 19, His Eminence Archbishop Justinian of Naro-Fominsk, Administrator of the Patriarchal Parishes in the USA visited St. Nicholas Church in Bayonne, NJ. 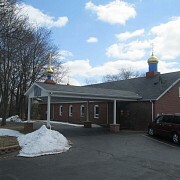 A combined Znammeny chant choir sang at the Divine Services. On July 17, His Grace Michael, Bishop of New York and New Jersey (OCA) met with His Eminence Archbishop Justinian at St. Nicholas Cathedral in New York City. On Tuesday July 15, A regular meeting of the Bishop's Council of the Patriarchal Parishes in the USA was held in the refectory of St. Nicholas Cathedral in NYC, under the chairmanship of His Eminence Justinian, Archbishop of Naro-Fominsk. On July 12 – the Holy Orthodox Church commemorates the memory of the Holy Glorious and all Laudable Apostles Peter and Paul. 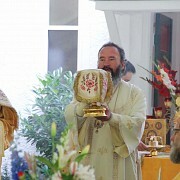 There are four parishes – and one chapel in the Patriarchal Parishes in the USA that celebrated their Patronal Feast. The Editors of the website would like to announce that Parishes of the Patriarchal Parishes in the USA now have the option to have a virtual tour of their Parish's interior, exterior and surrounding properties created by a reputable Third-Party Company here in the United States. 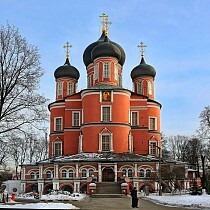 In connection with the repose of Metropolitan Vladimir of Kiev and all Ukraine, His Holiness Kirill, Patriarch of Moscow and all Russia called upon the Orthodox faithful of the world to pray for the newly-departed hierarch. 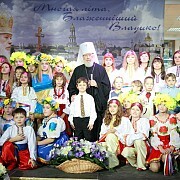 MEMORY ETERNAL: Early in the morning on July 5, 2014 - the head of the Ukrainian Orthodox Church of the Moscow Patriarchate, His Beatitude the Most Blessed Vladimir, Metropolitan of Kiev and all Ukraine reposed in the Lord after a lengthy illness.